Woo-Hoo! Table Tonic is a "Kidspot Top 50 Blogger"! That's right! 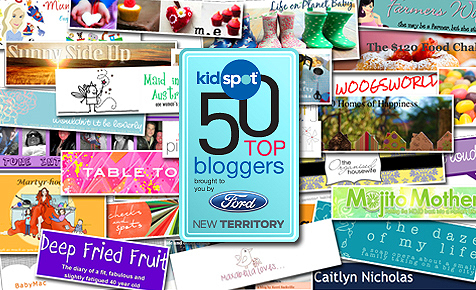 Table Tonic is a "Kidspot Top 50 Blogger"! I would love it if you would vote for me here. PS If you're a mum, have a good rummage around Kidspot. You'll love it. Thanks, Tonic-ettes! Done...and must say, you have prime position in the ad! Good luck and congrats too x.
Gday administrator, I just wanted to give you a quick heads up that your current Link: http://www. malicious blog in my browser ie. I'd highly recommend having somebody look into it. You could possibly lose a lot of readers due to this kind of problem. Best of Luck. this webpage, I have read all that, so at this time me also commenting here. however I in finding this topic to be really something which I believe I would never understand. I was suggested this blog by my cousin. I'm not sure whether this post is written by him as no one else know such detailed about my problem. You are wonderful! Thanks! Keep up the excellent works guys I've incorporated you guys to our blogroll.